It has been four months since Part II, where there was a flurry in accumulation of tools, books and some steps in actually drawing. I tried to draw whenever I could, whenever the opportunity arises, and this usually happens at meal times (while waiting for food), meetings (especially when someone else is presenting) or just snippets in-between times. I remember learning art history in sixth form at Portora, the story where a Edgar Degas asked Jean Auguste Dominique Ingres advice about becoming a better artist, and he famously said, “Draw lines, young man, many, many lines – it is in this way that you will become a good artist”. 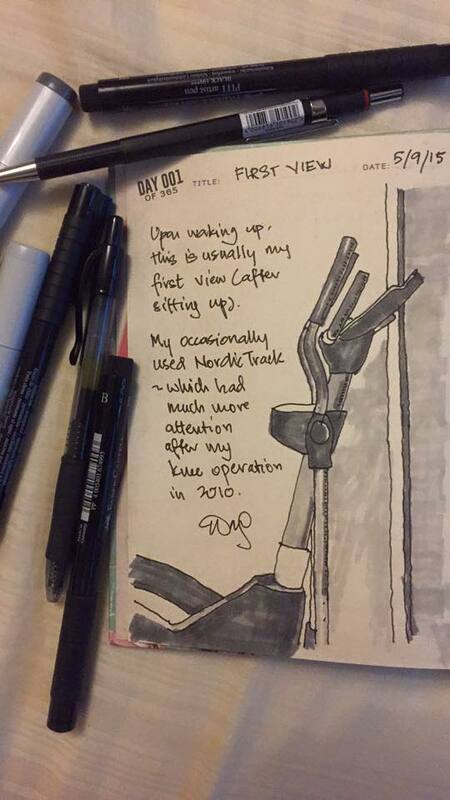 And draw many, many lines I did, in my Typo “Draw Something Everyday” sketchbook. I also went through a spell of drawing people, with a focus on my kids (and a portrait of the VC during the long hours of convo sesat in there somehow). The XS pen tend to favour organic drawings rather than objects, and the shadow lines/etchings work rather well with the fine strokes. 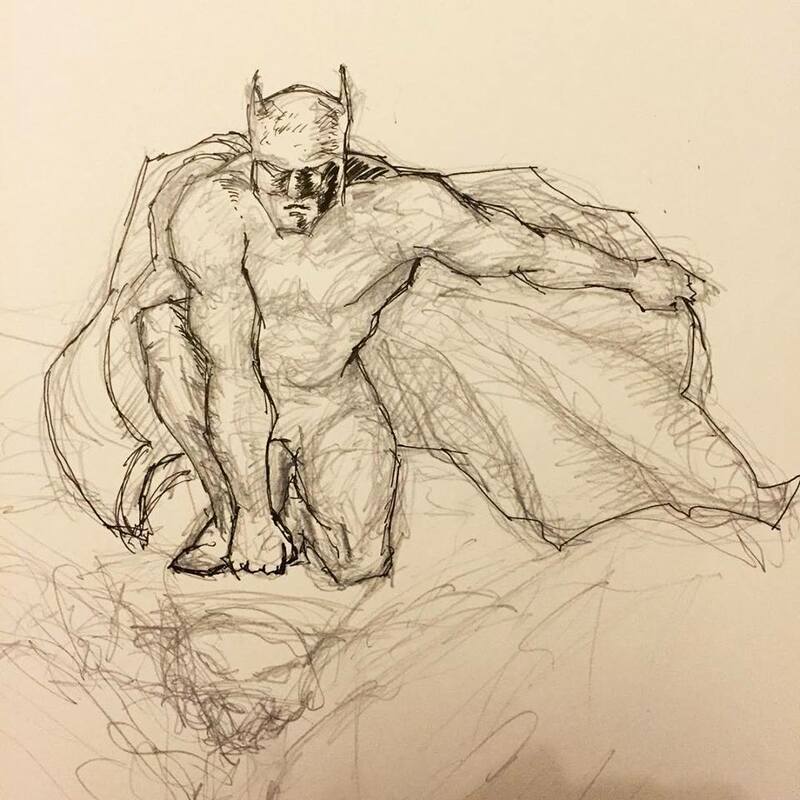 Had also wanted to fulfill a life-long ambition of drawing comics but never really got started. So 3 months ago I made a feeble attempt at a start, bringing to life an old idea on a title called “Johan Dol“. More explained at the link, even started a whole wordpress site for it, but yet to update. So thus is the final part of my artisitc journey revival, will update more on this through other relevant posts inshaaAllah. Ok, these were probably some of the best work I did at the time. On the left is the Terence Trent D’arby’s debut album cover, “Introducing the Hardline According to Terence Trent D’Arby” done with the ubiquitous orange and black pen called the Biro. Must’ve taken me some 4 hours to do, undertaken on a rather cold winter night in my room at Portora Royal School, Enniskillen in 1989. 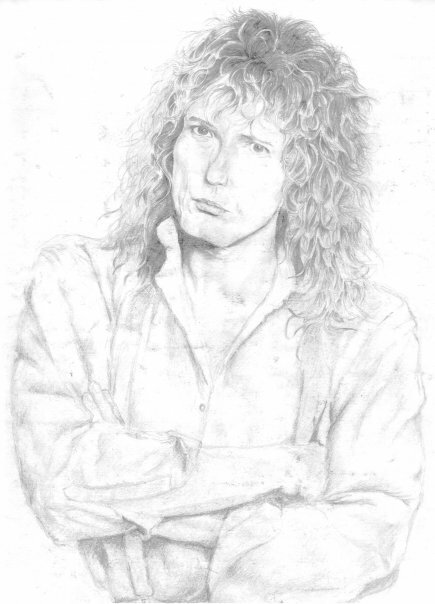 The second sketch which had survived the rigours of time was a pencil sketch of the then lead singer of Whitesnake, David Coverdale. Incidentally, I did go watch a Whitesnake concert some years later with him singing live. 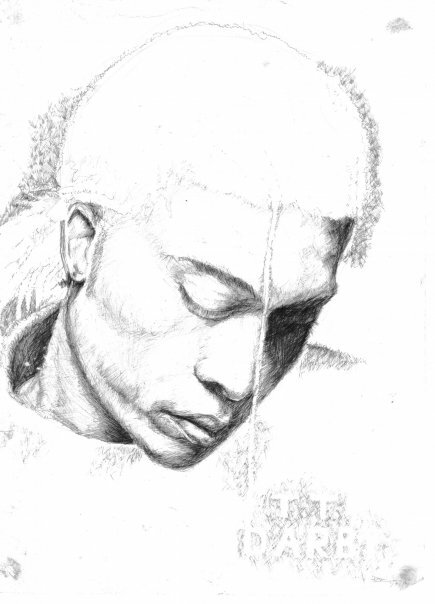 This sketch also took ages, especially getting his hair right! Used quite a range of Derwent pencils too, and although I did spray-fix the drawing it still had a couple of smudges. 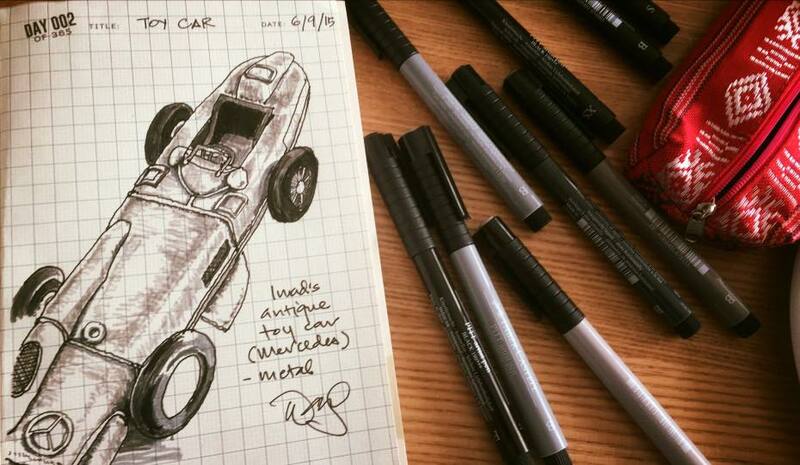 Ok, so those drawings were done over 27 years ago when I was drawing regularly. During my time as an architecture student at Catz in Cambridge I mostly did collages and isometrics, and cut-away sections which did not really involve drawing skills. So in order to restart my drawing fingers some quarter of a decade later, I did what any sane retired artist would do – I went shopping! 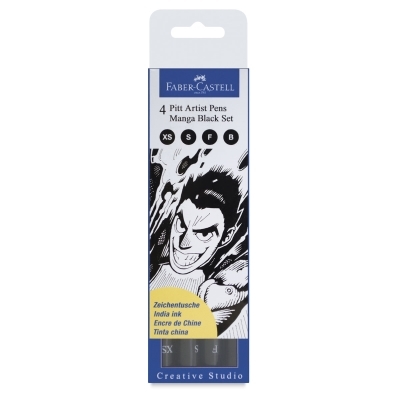 The set comprises felt nibs in sizes XS (very thin, good for detailing), S (best for drawing), F (good for outlines and emphasis) and B (brush nib which I have never used before and wanted to try). The featured image at the top of this post are depict the four pens and their line weights. I also purchased a Rotring Clutch pencil with a built-in sharpener (at the top of the cap). This was to be my testing paper – heavy enough to take watercolours and other medium. So immediately upon purchasing these, I did a Batman sketch whilst waiting for dessert at Franco’s, the Curve. The outlines looked OK until I tried inking – yikes! Now I really knew I had a problem with inking. 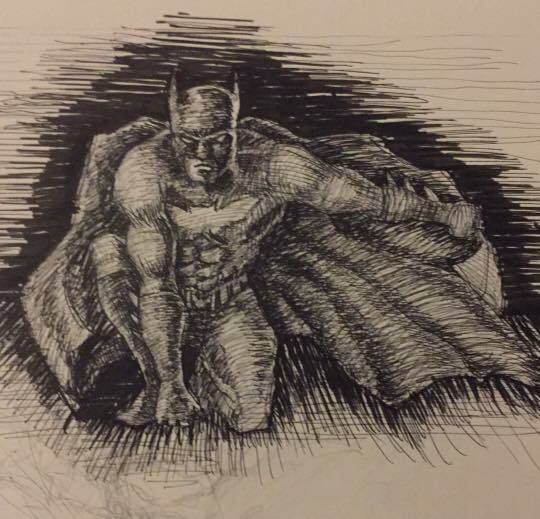 But before even looking into inking in detail, I knew I had to start drawing regularly, just to loosen my artistic muscles. I also needed to develop my own drawing style if I wanted to get some level of consistency. 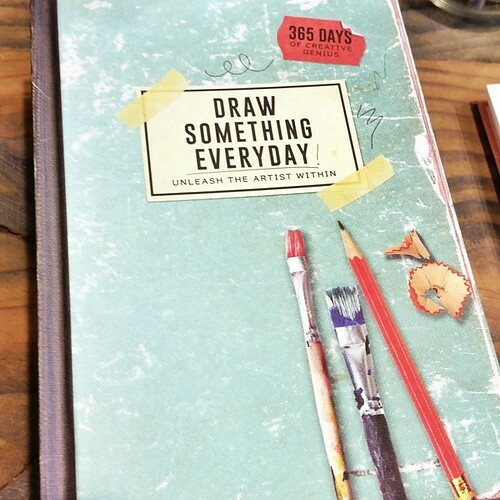 Then I remembered that during on of my visits to Nu Sentral, I had picked up a drawing journal called “Draw Something Everyday” at a cool shop called Typo. Now that would be a way to start, methinks. So I had more tools at my disposal, but needed more guidance. In order to ensure I do not stray from the original intent of producing comics, I was looking for books that would help me sketch better, and ink better. God’s grace certainly shone through that day when I was rummaging through MPH at One Utama and came across 2 books that fit both criteria. 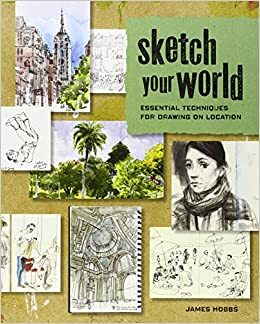 The first being James Hobb’s “Sketch your World: Essential Techniques for Drawing on Location”, a guide that looks at various techniques and methods for drawing on-the-go, an imperative skill that I need to acquire if I were ever to rediscover and further develop my drawing chops. It even intersperses the chapters with profiles of featured artists, delving a little deeper on their particular methods. Heartily recommended, this book got a 4.5 stars rating on Amazon, and 5/5 at Barnes & Noble! The other delightful find was John Paul Lowe’s “Foundations in Comic Book Art”. While not strictly a ‘how-to’ book nor is it a history of sequential art, this book manages to find an amazing balance of method and meaning, whilst using his own artwork as well as those from Savannah College of Art and Design (SCAD) where he has been teaching for over 20 years. Whilst the composition and construction of objects may seem a tad overblown (although useful or those really starting with basics), his exposition on inking (hurray!) is extensive and instructive for a neophyte like moi. Touche! interestingly, this book also received the same ratings as the above! Bookshops have always instilled a sense of wistfulness and adventure every time anyone steps into one. It is almost impossible to pass by a bookshop without stopping, if only to browse, to look, to linger. One could even sense one’s IQ almost increasing by just being there. I am sure my Fitbit Charge HR records increased palpitations wrapped around serenity in the vicinity of tomes. Art shops are different. One can not help feeling a sense of creative surge, a sense of endless possibilities waiting to be unleashed. 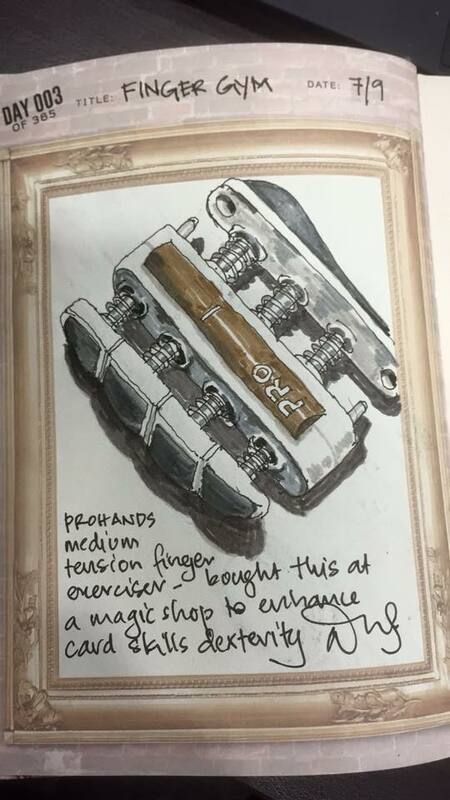 Pencils, pens and paintbrushes seem to wobble as soon as eager hands get within touching distance, almost as if one had entered Ollivander’s Wand Shop in Diagon Alley, where each art instrument aches and shivers in anticipation of being within its destined master’s possession. Discernment in the feel of the trade tools, and the weight and surface of the designated paper (not unlike thread-count of bed sheets) is personal. If bookshops made one feel more intellectual, art shops made one regard oneself as infinitely creative. 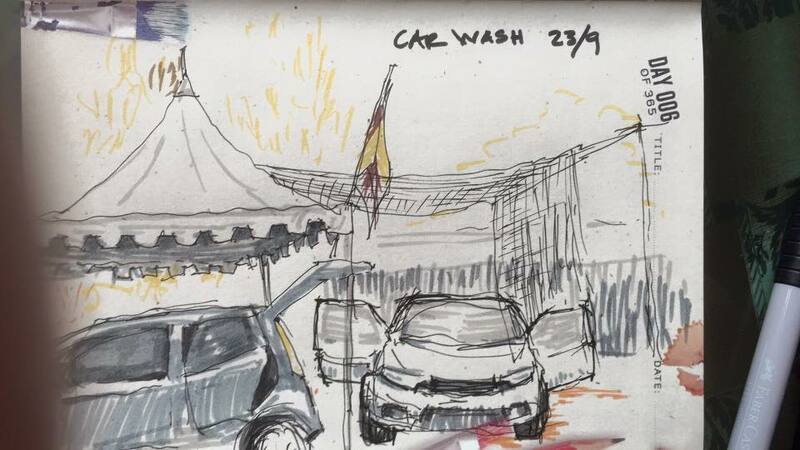 Although in the past few weeks all of the feelings above were sparked by a visit to Art Friend at the Curve, Mutiara Damansara, the origin of that ignition was an event that happened at St. John’s Primary (1) 40 years ago. Towards the end of every school year students were normally required to fill in a card, updating general information about themselves. There was a field, though, that was probably the most subjective thing anyone would ever ask you throughout your entire life, which more often than not morphs into different forms and elicit different answers, depending on the stage of one’s life. The field, or word, was ambition. I was in Standard One after all, and therefore the pressure to be a doctor, lawyer or accountant did not suffocate my answer as yet, unlike an SPM-bound 17 year old hormone-maxed student. At 7, most would be guileless, where the imperative would be what one would get for one’s next birthday, or what’s showing on the telly later. The answer would even be expected to be inconsequential, as it would probably change if the same question were to be asked next week, not even next year. So with aplomb, and a total lack of commitment (or maybe even full, hard to tell right now), my seven year-old self answered what made sense at that time. The answer was two straightforward words: comic artist. In the mid-seventies, comics in Malaysia were sold at newsagents and mamak grocery shops, often affixed to a suspended cotton or nylon rope with a wooden or stainless steel peg perched way above a 7-year old’s head. 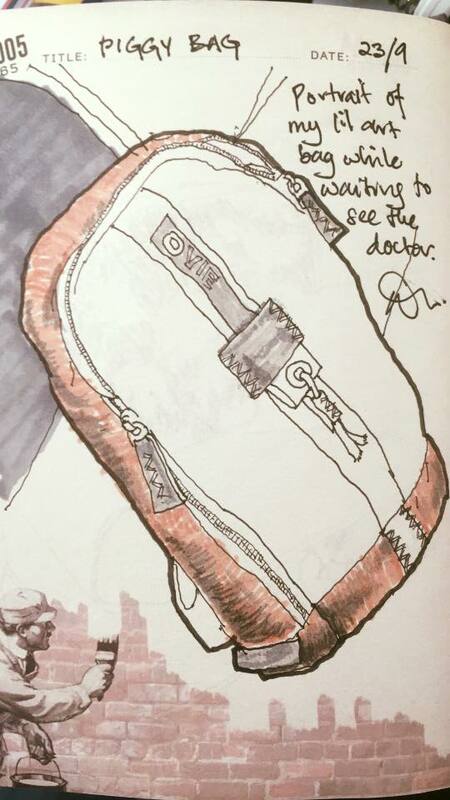 Sometimes it would get delivered to the home by the newspaper delivery guy, often wearing and off-centre motorcycle helmet aboard a kapchai, expertly throwing rubber-band-bound bundles of pre-ordered newspapers with unflinching accuracy into rain-safe nooks in close proximity to the front door. The world of Dandy and Beano, or the diminutive war or silat comics, were standard fare at the time. Occasionally, one would get a glimpse of a broadsheet Conan issue, and much later a 2000 AD, amidst SHOOT magazines and newspapers. What had really caught my fancy, though, and stayed as an effective bribe for me to go to the dentist, was American superhero comics. The American superhero comics, mainly from DC and Marvel, were of approximately the same dimensions today as they were 40 years ago. 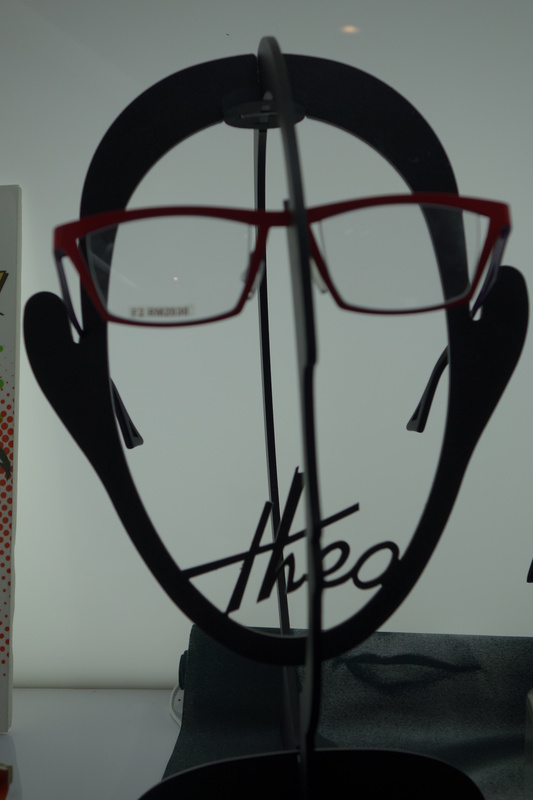 The white box at the bottom left or right, which today indicates whether the comic was obtained from normal retail channels or specialty shops, was filled with bar codes as it was from the former. There were no dedicated comic shops at the time till maybe the late 80’s or early 90’s. The form felt comfortable to a 7 year old, or even a 47 year old today. X-Men, Superman, Aquaman and the Avengers ruled the roost. Hardcover Annuals were coveted and sometimes gleefully received as birthday presents. Among the attractions of the American superhero comics was its temporal continuity, and one would await the next issue with bated breath only to be satisfied (and again tensely awaiting) a month or two later. They were also a tool for me to further learn English vocabulary; one particular episode of the Avengers, where the Vision was saved by another less-memorable character, I had learnt phrase “to be in one’s debt”, uttered by the former to the latter. Had to go to my father to get an explanation of that one, and the meaning stuck hard in my mind, especially when accompanied with the visual reinforcement. But it was that reinforcement, wonderfully visual, that stayed with me the most. Whilst distinct panels contained the artwork, the panels did not stay uniform, contextually reforming like a storytelling ether-chameleon, where words and art danced to depict a story whose pace was half in control of the producer, and the other half by the reader. While the composition of views of bodies and surroundings uncovers the narrative(s), it was the inking and colouring that lent it emotion and motion, superiority and/or utmost insignificance. Jack Kirby and Neal Adams led the way for me, to be joined by later giants as John Romita Jr, Brian Bolland and the ambidextrous writer-artist combination of the brooding world of Frank Miller, the delightful yet scary world of Bone by Jeff Smith or the insane multi-media stylistics of Bill Sienkiwicz and later Dave McKean. These artists, and who had every right to be called Artists, made my world. At the time, for a time. Fast forward 40 years. I am in my 10th job, having experienced various fairly diverse industries, yet none close to what my 7 year old self had opined. During a conversation with my second-born, when talking about ‘ambition when one grows up’ (have I even grown up? 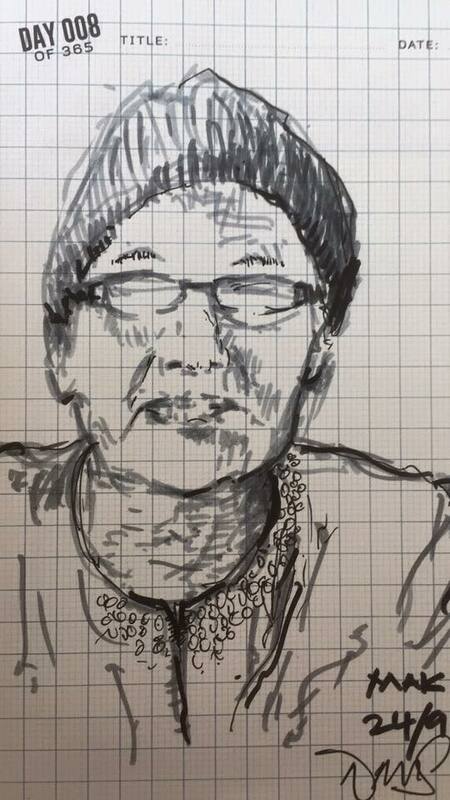 ), he further quizzed me on why I have not fulfilled my ambition. When I thought about it, I then asked myself, why not indeed? Part II deals with what comes next.